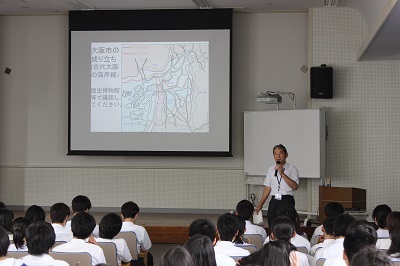 The 5th SGH lecture took place on Thursday, June 18. We invited Mr. Kazunobu Kuroda of the Osaka City Crisis Management Division to give a talk on the current situation and issues related to earthquake and flood measures in Osaka as well as disaster prevention and mitigation measures that should be taken by regional communities. 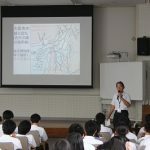 Learning about the various cases in which local governments and communities take measures towards disaster prevention and mitigation was a good opportunity for students to give thought to what they could do as high school students. The lecture lead to pair activities after students returned to their classrooms.